At a national and local level we are asking individuals, politicians, government, state agencies and other groups to sign up to higher standards which are based on international best practice, and sufficient funding to back that up. Funding for walking and cycling amounting to at least 20% of the national capital transport budget every year. The detail of these elements can be found by clicking on the above links. The idea is that individuals, councillors, TDs and groups who sign up will look to push for or adopt higher standards into plans, policies, and law at national, regional and local levels. Councillors should also strive to make sure these standards are upheld when councils are changing their areas and TDs should look to ensure transport funding is well spent on high quality projects. 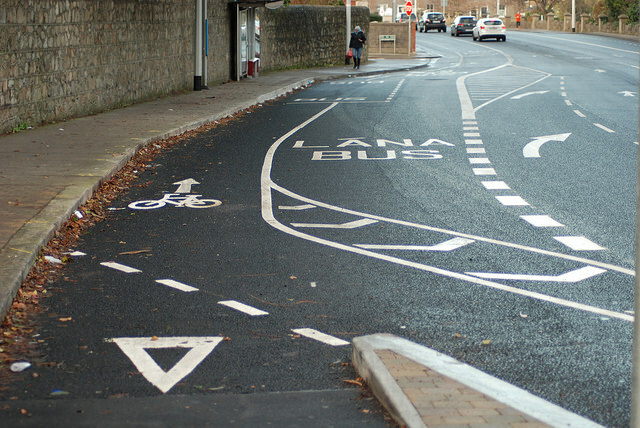 IMAGE: A cycle route scheme built in 2013 which mixes cycling with buses, which is not compliant with Cycling for All standards. 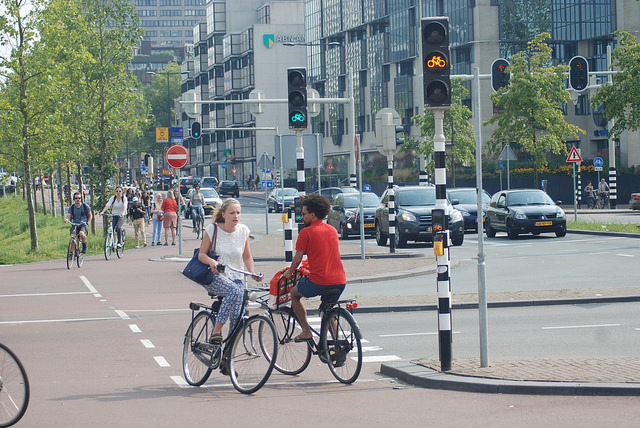 National guidelines — including the Manual for Urban Roads and Streets, the NTA National Cycle Manual, the NRA/TII rural route cycle manual — are generally sound in principle. 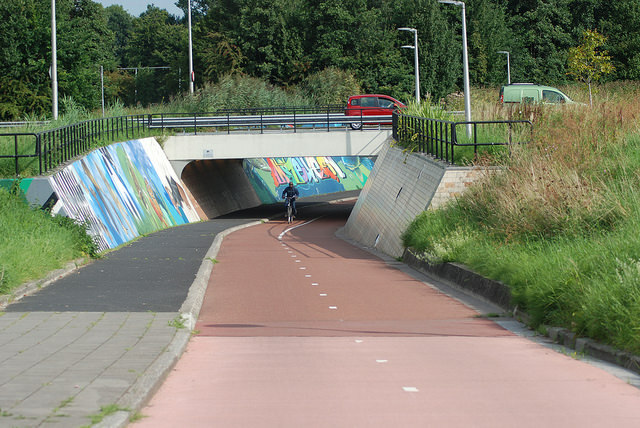 But these and other guidelines are lacking or flawed when it comes to many details and need to be partly rewritten to follow best the international design standards (to be clear: that’s the Netherlands). The details on this website are core to the CyclingForAll.ie policy. Without being offer watered down, the details need to be integrated into current design guidelines, law and any relevant policy documents. The points made on this site should generally be seen as complementary to most of the existing guidance, although where there are conflicts, the points made here must override existing guidance. 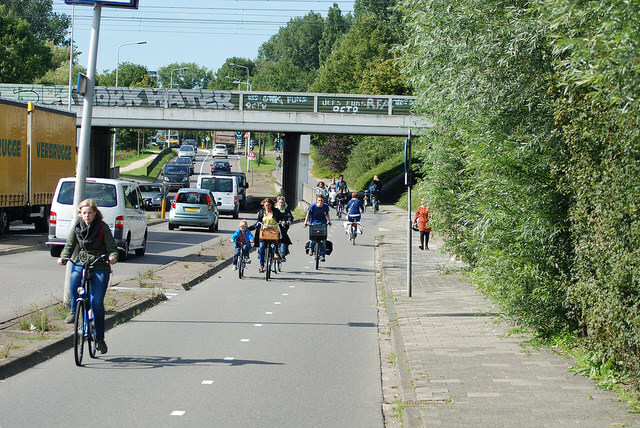 Cycle routes on busy roads are safe enough for children to use. 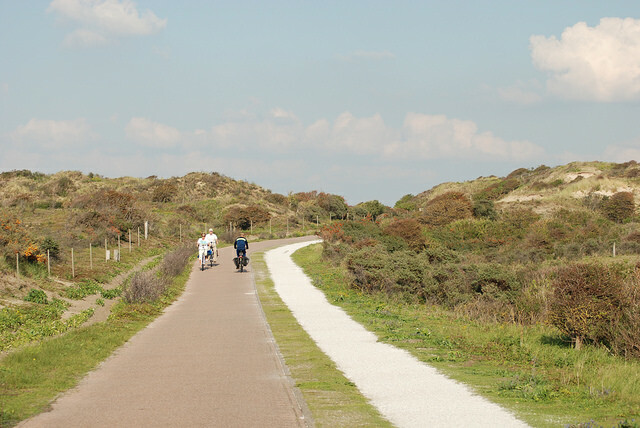 Busy greenways (like parts of the EuroVelo 12 The North Sea Cycle Route) include separate paths for cycling and walking. 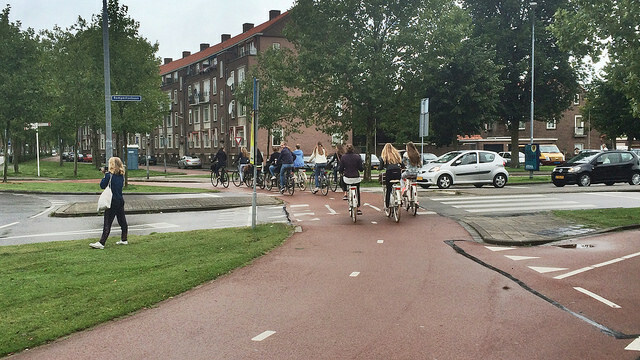 Cars and bicycles are kept separate at junctions. 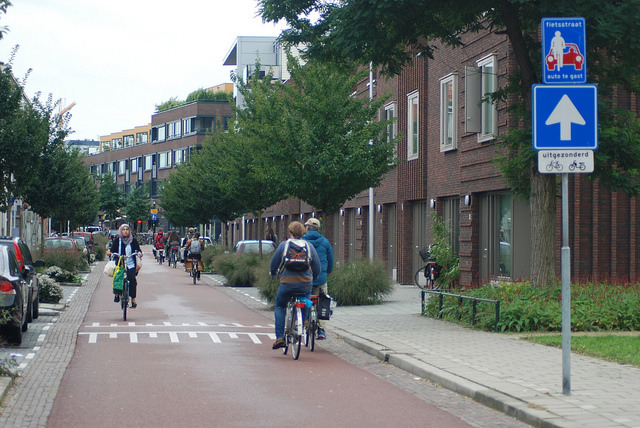 On narrower streets, cycling is allowed in both directions (including contra-flow) when motorists only go one-way. 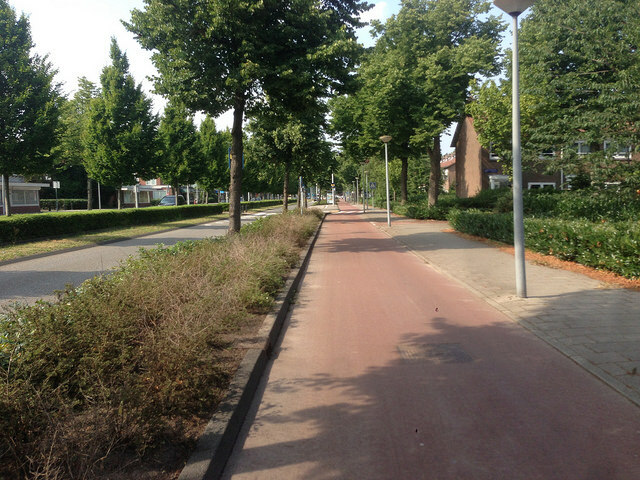 In urban areas cycle paths around roundabouts have priority, enabling children to cycle to school independently. 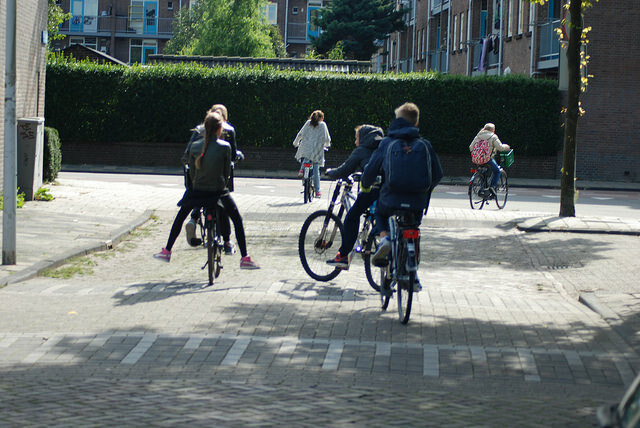 Primary school children are enabled to cycle home from school on their own. 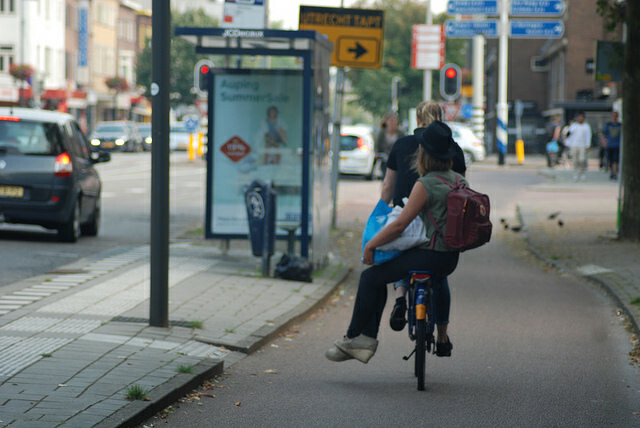 Cycle paths “bypass” bus stops rather than mixing people cycling with large buses. 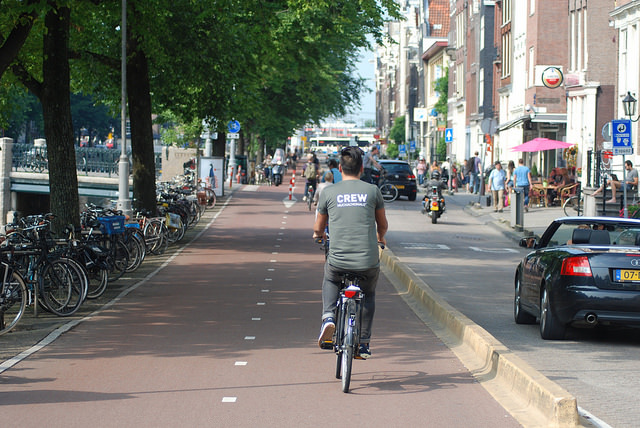 Buffer space between cars and cycle paths offers extra safety and comfort. Where the risk of car parking / loading is high, ‘heavy’ segregation is used. 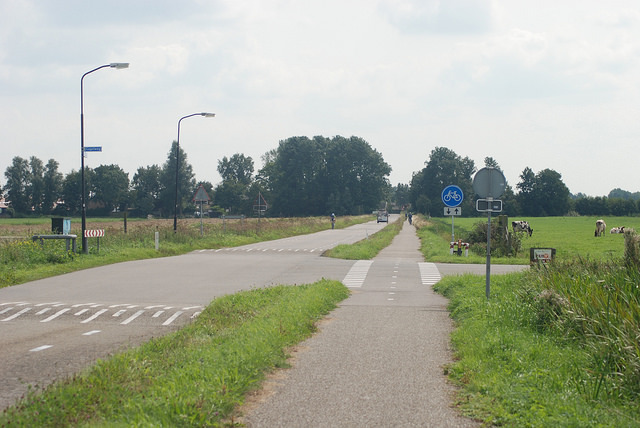 Cycling gets priority over side roads, even on many rural roads. 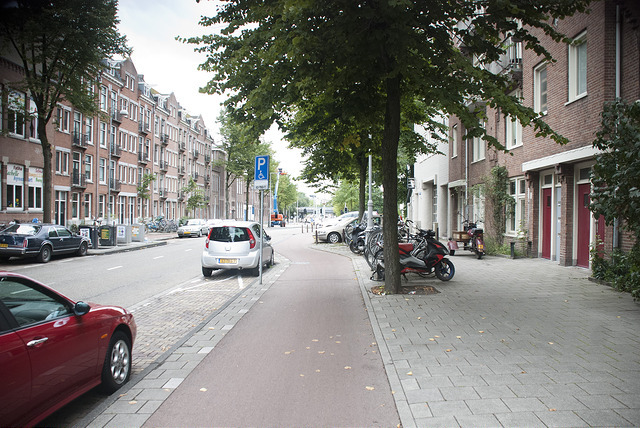 Cycle paths are protected by car parking, rather than having cycle lanes protect cars. 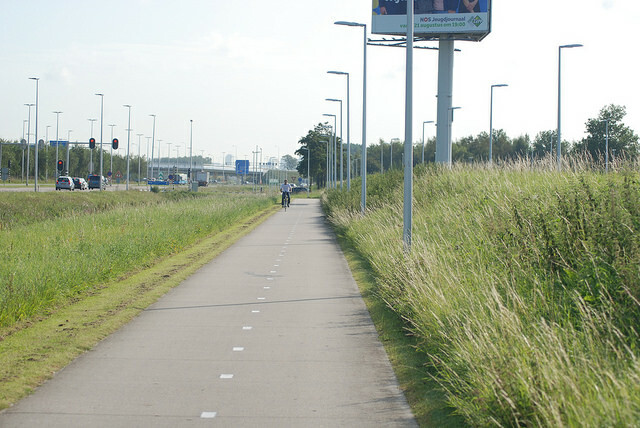 High-quality cycle routes parallel to motorways. 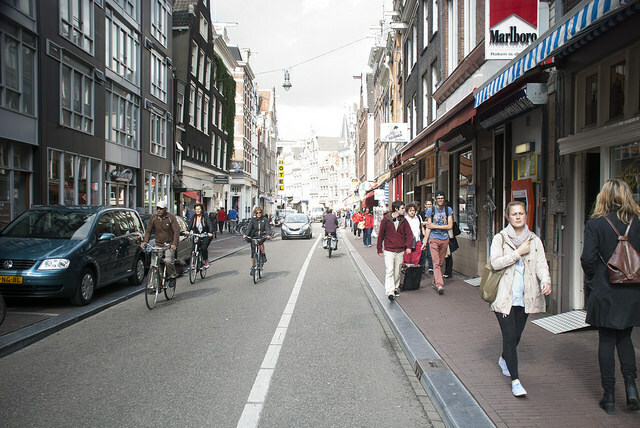 Bicycle streets where “cars are guests” allow more minor streets and roads to be turned into through routes for cycling, but motorists are limited to local access before returning to a larger road. 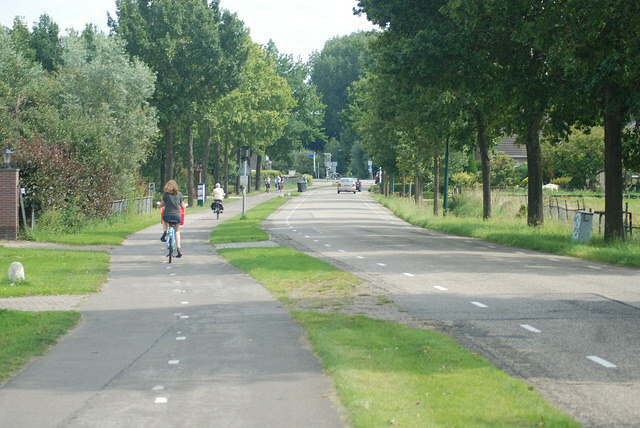 Cycling is grade-segregated from larger roads. 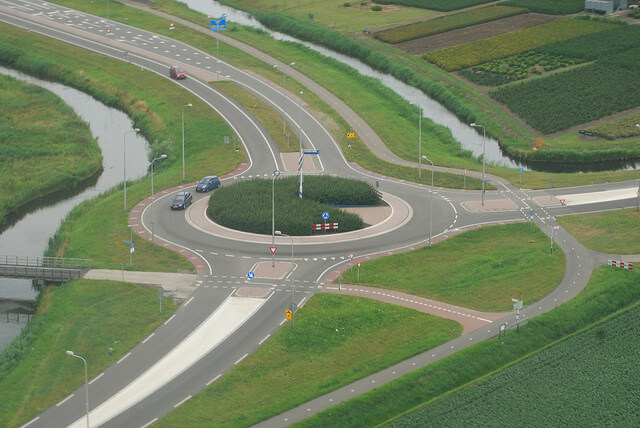 A rural roundabout and cycle paths keep people away from high-speed roads. 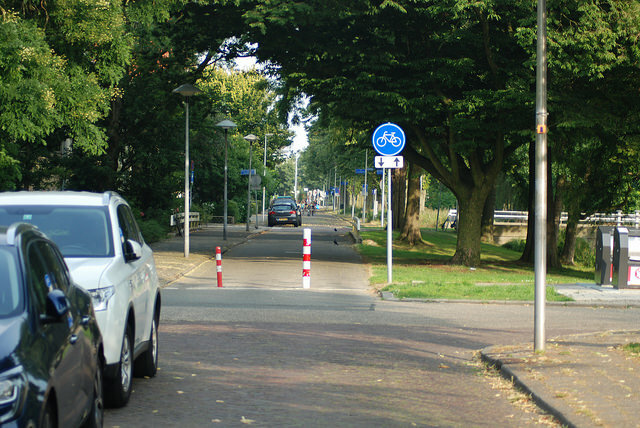 Cycling has more permeability than motoring, bollards are used to stop rat running.